SBI Youth Fellowship 2018 Application Form- The State Bank of India organises SBI Youth for India Fellowship Program for the outstanding young minds and graduates who are willing to participate in the fight against poverty and for the development of India through the conductance of State Bank of India Youth for India Fellowship 2018. The State bank of India in association with many respective NGOs to improve the state of the rural communities for their betterment. The SBI Youth Fellowship has been started and managed by the authority of state bank of India. Any graduate candidate with the inspiration of helping such locality can participate in SBI Youth Fellowship. The project would be for 13 months of duration. 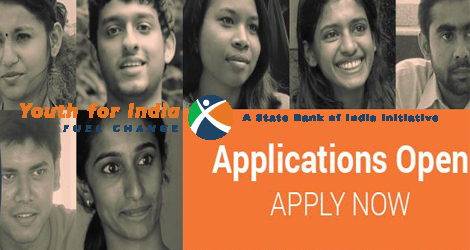 The State bank of India youth for India fellowship Notification has been released on the official website. All the desiring and eligible candidates can check SBI Youth for India Fellowship Eligibility. Whosoever will be selected will get SBI Youth for India Fellowship Rewards as mentioned below. The SBI Youth for India Fellowship Application form should be filled to appear in the scholarship program. We are providing you with the direct link through which you can fill the form and apply for this fellowship opportunity. The applicant must have completed his/ her graduation degree. The candidate must be ready to relocate to the rural area. The applying candidate’s age must be between 21 years to 32 years. At the initial stage, the applicants would require to visit the official website. Then click on the SBI Youth for India Fellowship Application Form tab. Enter all the details correctly and submit it. Later, on the basis of the application form records, they will be called for interaction or interview process. At last total, 100 candidates will be selected. whosoever will be selected in the end they will get the living allowance, local travel allowance, travel expenses, medical insurance, readjustment allowance, and some other supports also as per SBI Youth for India Fellowship Reward.